Wells speaks after VFL return Watch new Magpie Daniel Wells discuss his long-awaited first game for Collingwood after the Magpies two-point VFL victory over Coburg. 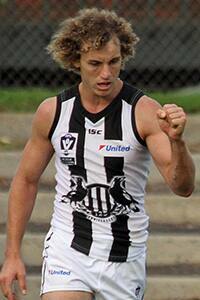 Chris Mayne kicked two goals in Collingwood's two-point victory over Coburg (Photo: Shane Barrie). Jordan De Goey kicked three goals and produced a best-on-ground performance in his return from injury to lead the VFL Magpies to a hard-fought two-point victory over the Coburg Lions. On a gloomy Saturday afternoon at Piranha Park, the 21-year-old opened the game in blistering fashion with two first-quarter goals, before finishing the match with 26 disposals and three majors. “He was really good, he was lively,” VFL coach Jared Rivers said of De Goey post-game. “Clearly he’s a good player and I think you can tell he’s one of those guys we’ve been missing out there in AFL level. De Goey was joined as a stand-out by father-son recruit Josh Daicos in the first term, who exhibited the class associated with his surname by kicking two goals of his own in the opening 30 minutes. The game also marked the return to football of highly touted recruit Daniel Wells, who has been recovering from a calf injury. The 32-year-old played out most of the game and moved well as he floated throughout the midfield and the back half. “It was good for him to get through the game. He played his role well and his composure late in the game down back was really good. Hopefully he pulls up well,” Rivers said. Upcoming midfielder Brayden Sier’s unlucky run of injuries continued, with the youngster having to sit out the second half with a head knock. With Collingwood in control in the opening half, it was the Lions who fought back to lock up the game after the long break. Filled with momentum swings, wayward kicking and missed shots at goal, both teams entered an arm wrestle contest, with a passionate home Coburg crowd egging their team on. Chris Mayne kicked two goals for the Magpies in the second half, while his AFL counterpart Lynden Dunn steadied the tide from defence, raking in 31 possessions. With Coburg asserting themselves in the midfield in the final term, it was a VFL-led Magpies midfield of Alex Woodward, Lachlan Tardrew and stand-in captain Nick Gray who battled away in a scrappy contest. With 10 minutes to play in the last quarter, the Lions kicked truly from the set shot giving them their first lead of the game. But the Lions’ fairy tale ending didn’t last long, with Magpies defender Jordan Kelly clinching a Collingwood victory after slotting a clutch goal with only minutes to play. The VFL Magpies will be eager to put the result behind them, and will look ahead to its Anzac Day clash against Essendon next Sunday at Windy Hill.